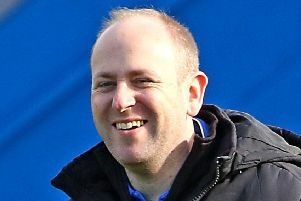 Lancaster City boss Mark Fell hailed new signing Paul Dawson after he enjoyed a dream debut for his home-town club on Saturday. 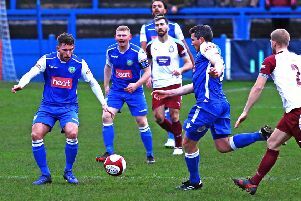 The 20-year-old popped up in the last minute to score the winner as the Dolly Blues battled to a terrific 1-0 victory over relegation rivals Witton Albion at Giant Axe. Dawson – who is from the city and lives just a stone’s throw from the ground – slotted home from inside the six-yard box after a goalmouth scramble following a corner in the 90th minute. The win saw City move out of the relegation zone and it was a goal which had Fell beaming from ear to ear. “Signing Paul was a really straight forward deal,” said Fell, who enticed the midfielder from Bamber Bridge last week. “The biggest thing was he wanted to come and play for Lancaster City. “It is his club – he lives so close to the ground. “It is hard to understand how the club have missed him – he’s been at both Kendal and Bamber Bridge. “He played in midfield for us on Saturday and did a really good job for us. “He also has the knack of popping up and scoring goals, which he did against Witton. Fell praised both sides for the way they coped in what was horrendous weather conditions, which turned the pitch into a quagmire by the final whistle. “The game was played in absolute horrendous conditins and credit to the players, the referee and the club for getting the game to go ahead. “I think the games at Workington and Kendal were both abandoned, but our pitch held up as well as it could have done given the conditions. “Both teams tried to play – still tried to do the right things. City have now stretched their unbeaten run to four games and they have a terrific opportunity to move five points clear of the drop zone this weekend. With North Ferriby United seemingly cut adrift at the bottom with Workington next to them looking increasingly marooned. Mickleover Sports are third from bottom on the same number of points as Stafford Rangers, who welcome Lancaster to Marston Road this weekend. Fell admits his team face a crucial few weeks as they look to secure their status in this division. “We now have three away games against teams who are all in the relegation mix with us. We have Stafford this weekend, then we have Whitby Town, which should be a good day out, and then Bamber Bridge. On the injury front, Fell is hopeful Steve Williams will be available after coming off against Witton with a sligh calf strain. Paul Jarvis should be fit after suffering concussion.